The University of Toledo College of Medicine and Life Sciences has named new chairs of the Department of Public Health and Preventive Medicine and the Department of Obstetrics and Gynecology. Dr. Sheryl Milz is the new chair of the Department of Public Health and Preventive Medicine, and Dr. Kelly Manahan will chair the Department of Obstetrics and Gynecology. Milz joined The University of Toledo faculty in 2001 from the Naval Hospital in Great Lakes, Ill. She received her bachelor’s degree in biochemistry and master’s degree in preventive medicine from Ohio State University. She received her PhD in public health sciences from the University of Illinois at Chicago. Manahan has been a member of the faculty at the University since 2009. She received her doctorate from the Indiana University School of Medicine and completed her obstetrics and gynecology residency training at the former Medical College of Ohio. She completed research and clinical fellowships at the University of Louisville and University of Michigan, and she previously held positions at the University of Iowa Hospitals and Clinics and St. Vincent Indianapolis Hospital. Gold also expressed his gratitude to the two search committees chaired by Dr. Dorthea Sawicki and Dr. Gerald Zelenock, the department members, department chairs, faculty, residents, students and staff for their time and effort in the academic search process to select these new department chairs. While some University of Toledo faculty members traveling abroad this summer may be doing so to unwind from a hectic spring semester or to visit friends and family during vacation, others are hard at work teaching and advancing their research. Dr. Neil Reid, UT associate professor of geography and planning, and director of the Urban Affairs Center, is one such dynamo. He returned recently from Poland, where he taught a weeklong intensive course as a visiting professor at Czestochowa University of Technology. Reid resided in the southern Polish city of Czestochowa from May 30 to June 3 to teach a course titled Industrial Location and Regional Development. It met for six hours each of four days. “The objective of the course was to help students understand the factors that underlie the location decisions of companies, whether they are in the manufacturing or service sectors, and then to understand the implications of these location decisions for regional economies,” Reid said. Through the course, the students examined different location theories companies use to determine where to construct their facilities and then considered the economic effects enjoyed by chosen communities, as well as strategies they could use to attract corporate investment. 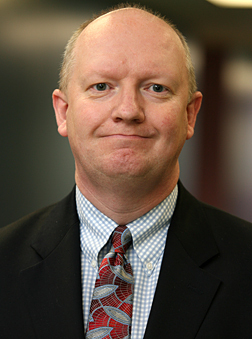 Dr. Neil Reid gave a colloquium, “Cluster-Based Economic Development,” in the Lecture Theater for the College of Management at the Czestochowa University of Technology. The course was offered to graduate students of an experimental interdisciplinary graduate program associated with the European Faculty of Engineering at the institution. “The aim of European Faculty of Engineering is to provide a more general profile of education, bearing in mind the necessity to adapt graduates to the varying needs of our job market,” said Dr. Stanislaw Drobniak, director of the European Faculty of Engineering. He added that the English format of the courses is designed to prepare students for employment in international companies that open factories in Poland, where many graduates of the program usually find work. While in Poland, Reid also discussed possible collaborative opportunities with his colleague at Czestochowa University of Technology, Dr. Piotra Pachura, who also researches regional development as a professor of business and technology. Pachura invited Reid to Czestochowa for this stint as a visiting professor last November. The two met at a regional development conference in Germany in 2009. 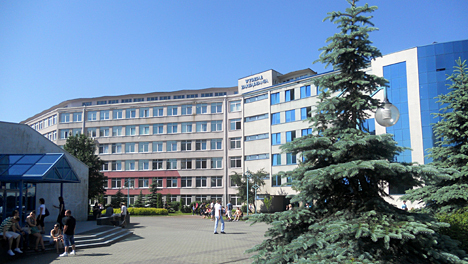 While in Poland, Reid also prompted Pachura to help coordinate a 2012 regional development conference at Slovakia’s Presov University for the International Geographical Union’s Commission on the Dynamics of Economic Spaces, which is an organization Reid chairs and for which he is responsible for organizing conferences. This was Reid’s first experience teaching abroad as a visiting professor and said that Drobniak already has invited him to teach the course again. “This was a very enjoyable and rewarding trip,” Reid said. A member of Carlson Library’s staff has retired after more than four decades of service at The University of Toledo. 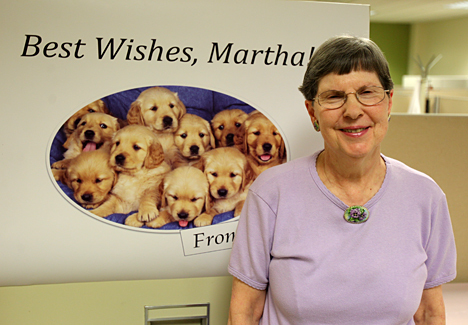 Martha Gregory, who worked at Carlson Library since July 1, 1965, retired from her position as a library associate June 30. Many of Gregory’s contributions have been done behind the scenes, faithfully updating library information. “A lot has changed. When I started, we still had the card catalogue; now everything is done online,” she said. Her colleagues said they will miss her skills and capacity for work. Before coming to work for UT, Gregory taught vocal music at an elementary school, but she soon discovered that teaching was not for her. “It took several years for me to find it, but I eventually found the job I was meant to do,” she said. Gregory’s UT “family” extended to her off-campus life as well. Her husband, Dr. Elmer Richard Gregory, was an English professor at the University until his retirement in 1998. He died in 2009. She plans to spend her free time becoming more involved in her church and, not surprising since she worked in a library, catching up on her reading. Signs that change is literally in the air are evident as the effective date for UT’s revised tobacco policy draws near. Construction on several designated tobacco use areas continues, and signage will be posted throughout UT’s campuses before students return. The revised policy will take effect Monday, Aug. 1. The policy restricts tobacco use to the designated huts, but does not affect Health Science Campus, which has been tobacco-free since 2006. Alexis Blavos, alcohol, tobacco and other drug prevention specialist and a member of the committee that crafted the policy change, has hosted monthly informational meetings since the revision was announced. During the meetings, held the first Tuesday of each month in various locations, Blavos discusses tobacco cessation methods, including medication, support groups and online counseling. “I tell anyone who’s attempting to curb or stop their tobacco use to check their individual insurance plans to see what type of assistance is covered,” Blavos said. For more information on the monthly meetings, click here. Seven of the designated huts will be scattered across Main Campus, with one each on the Scott Park Campus for Energy and Innovation and at the Lake Erie Center. Barbara Tartaglia has returned to The University of Toledo as the associate vice president for development for Main Campus and principal gift officer for the College of Law. Tartaglia, who has more than 15 years in the advancement field, worked at UT from 2001 to 2008 as the principal gifts officer for the College of Business. In her new role, Tartaglia, a certified fundraising executive, manages the fundraising staff for the UT Main Campus and designs and implements fundraising activities in support of the law school. From 2008 to 2011, Tartaglia served as associate vice president and principal gifts officer at the University of Cincinnati Foundation, where she participated on the senior leadership team that coordinated its $1 billion capital campaign. A 2005 UT alumna who received a master’s degree in liberal studies, Tartaglia was responsible for raising $17 million for the College of Business. Recognized as a 10-star presenter by the Council for the Advancement and Support of Education, Tartaglia speaks nationally on topics in her field. 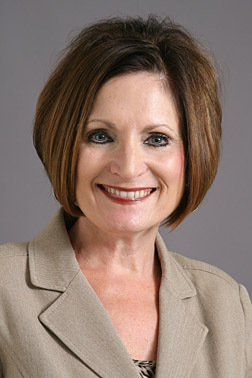 A member of the Association of Fundraising Professionals, she served as president of the Northwest Ohio Chapter of that organization in 2005-06. The University of Toledo football team was picked to finish first in the Mid-American Conference’s West Division in voting performed by 26 members of the league’s media contingent. The annual preseason poll was released yesterday at the conference’s 2011 football media day held at Ford Field. The Rockets received 83 votes in the annual poll to edge defending West champion Northern Illinois (81) by two points. Western Michigan (76) was picked to finish third followed by Central Michigan (55), Ball State (27) and Eastern Michigan (24). Toledo also received the most votes to win the annual Marathon MAC Football Championship Game between the winners of the West and East divisions. UT led the way with five votes, with Northern Illinois and Miami gaining three votes. Ohio and Western Michigan also received one vote. UT Head Coach Tim Beckman said the vote of confidence for the Rockets is an indication of the progress of the program. If Toledo were to win the West Division title, it would face the winner of the East Division. Selected to win the East Division title was defending MAC Champion Miami with 97 points, followed by Ohio with 96. Temple was chosen third in the East with 88 points followed in order by Kent State (57), Bowling Green (48), Buffalo (37) and Akron (25). 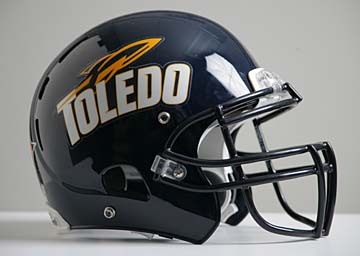 Toledo is coming off an 8-5 season in 2010 (7-1 MAC), including an appearance in the Little Caesars Pizza Bowl vs. FIU. The Rockets return 17 out of 22 starters, nine on offense and eight on defense. Among the returners are junior All-America wide receiver/kick returner Eric Page and four other players who earned All-MAC honors in 2010. The Rockets report to training camp Tuesday, Aug. 2, with the first practice coming a day later. As has been his custom, Beckman will live with the team in the dorms for the first three weeks of camp. Travis Sanderson worked on a vase for Art on the Mall. He’s a young, hot artist — literally. Travis Sanderson leaves the garage door open to catch some air while working in the Old No. 9 Studio and Gallery in Toledo. The ceramist grabs a block of clay, pulls up a stool emblazoned with racing flames, and takes the potter’s wheel for a spin. Within seconds, his hands shape a smooth, cylindrical vase. Sanderson makes it look effortless. “I like to be able to take things as basic as dirt, water and fire and make something beautiful — and not even necessarily something beautiful, just turn it into something creative,” he said. He pushes in several sections of the vessel, giving it an organic look. Some of his artistic pieces look like they sprouted outside. Check out thefirehousearts.com. “I’ve had people describe my work as underwater coral or something growing in the woods under a big pine tree,” Sanderson said. It’s no wonder the environment inspires him. 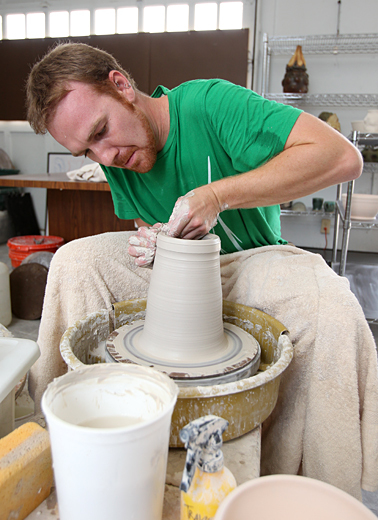 After receiving a bachelor of fine arts degree in ceramics from UT in 2008, Sanderson headed west to work as an apprentice for one year in Montana at Whitefish Pottery. “I learned more the business aspect of the art; I got to work some art fairs,” he said. That experience should help Sanderson, who will be one of more than 100 exhibitors at Art on the Mall, which will take place Sunday, July 31, from 10 a.m. to 5 p.m. on UT’s Centennial Mall. Finished pieces by Travis Sanderson are shown off in a natural setting. “I think Art on the Mall is a great gig because it allows an emerging artist the opportunity to be seen at the same venue as established craftspeople,” he said. 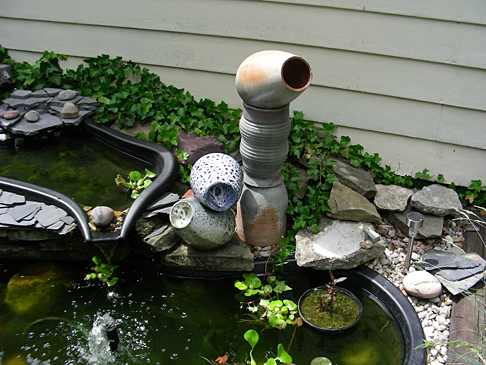 Sanderson will have an array of pieces at the free, juried event. His everyday fare includes mugs, mixing bowls, teapots and plates. But the works aren’t ordinary. Sanderson adds textures with anything from carpet and mesh to shells and metal grates on eye-popping deep greens, bright blues, earthy browns and ashen grays. Sanderson will have a few wood-fired works at Art on the Mall. In the meantime, he’ll be heating up the kilns to 2,200 degrees at the former Toledo fire station, Old No. 9 Studio and Gallery, 1841 Broadway St.
One year ago, ProMedica and The University of Toledo established the Academic Health Center, a relationship intended to enhance clinical education and research in the community and help ensure that a new generation of health-care professionals will be ready to care for community members in the decades ahead. The relationship between the two organizations continues to strengthen. In fact, The University of Toledo and ProMedica have extended the contractual relationship. After completion of the original agreement in 2016, the agreement automatically will renew for successive three-year terms. To further emphasize the focus on keeping talented caregivers in the community, ProMedica and The University of Toledo have established the Better Together Scholarship Fund. The purpose of this fund is to promote and improve retention and recruitment of health-care providers in northwest Ohio and southeast Michigan by providing financial assistance to physicians of demonstrated ability who desire to further their education and training at The University of Toledo College of Medicine and Life Sciences. ProMedica will create this fund with an initial $500,000 gift, with a goal by the two organizations to raise an additional $4.5 million. Two scholarships will be awarded each year, increasing to eight scholarships over time. The Academic Health Center has made significant progress in its first year. • By 2016, there will be a total of 63 residency rotations by UT learners at ProMedica, with the addition of 29 new residency rotations and 26 expanded rotations. The number grew from 17 rotations last year to 31 in the current academic year. • UT learners are significantly expanding their educational experience at ProMedica facilities. New rotations have been developed and implemented in anesthesiology, emergency medicine, obstetrics and gynecology, medical oncology, and ear, nose and throat. In addition, the Academic Health Center is evaluating opportunities in vascular, cardiovascular, pulmonary/critical care, and pharmacy, among others. • Relationships are expanding in all areas managed by the Academic Health Center; these include undergraduate medical education, nursing, allied health, pharmacy, library and information technology. • In clinical research, since July 2010, 60 new clinical trial agreements were signed involving hundreds of patients. Twenty-six of these are cross-institutional, cooperative trials. • In addition, 14 qualified letters of intent were received for Translational Research Stimulation Awards. Six were selected for full proposals, all of which are collaborative projects involving UT and ProMedica investigators and will be funded as collaborative research studies in clinical care. 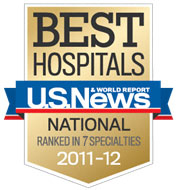 U.S. News and World Report recognized The University of Toledo Medical Center as the best hospital in the Toledo metro area for 2011-12. The magazine ranked UTMC as a high-performer in seven clinical specialties, the most of any institution in the area. “It is clear that U.S. News understands what the Toledo community already knows: The University of Toledo Medical Center offers patients superior care, a great experience and a higher degree of healing,” said Dr. Scott Scarborough, senior vice president and executive director of UTMC. “Caring for patients is a team effort, and this is an accomplishment that the entire team should be proud of,” Scarborough said. “Hospitals across the nation look to America’s top tier academic health centers to set the standards for health care and Toledo is no different. It is the blend of educational programs, innovative research and patient-centered clinical care that sets the stage for this recognition,” said Dr. Jeffrey P. Gold, chancellor, executive vice president for biosciences and health affairs, and dean of the College of Medicine and Life Sciences. The University of Toledo Medical Center has achieved top 10 status in a recent quality standards report. UTMC ranked ninth in a survey examining Surgical Care Improvement Project (SCIP) measures, ahead of the University of Michigan and Ohio State University. The Hospital Quality Measures Report is generated by University HealthSystem Consortium, an organization comprised of 113 academic medical centers and 255 affiliated hospitals in the United States. Generated quarterly, reports capture data examining 11 SCIP standards. “SCIP measures are based on practices and policies that decrease the risk of complications, such as infections, blood clots and other conditions that can negatively affect the outcomes of surgical patients,” McGinnis said. As part of a continuous focus on quality, a Surgical Care Improvement Committee was formed in 2008 to evaluate the delivery of patient care. The committee met weekly, at first, poring over real-time data, policies and procedures. With UTMC’s progress, McGinnis said the committee now meets monthly, but daily data allows him to determine whether intervention is necessary. The Cleveland Clinic was ranked first in the most current University HealthSystem Consortium report, which analyzed data gathered from October to December 2010. Although McGinnis said his goal isn’t necessarily to be No. 1, he isn’t ruling it out. Better care for patients, he noted, was always UTMC’s focus, but it will be increasingly important as reimbursement is further tied to quality. As of July 1, 2012, McGinnis said reimbursement percentages allowed from federal insurances, such as Medicare and Medicaid, largely will depend on an organization’s quality compliance.